I have increasing respect for historians who try to decipher events from hundreds of years ago. They have shreds to work with. What I am writing about is from only five years ago. I was part of it. I have my story of what happened. But still, it’s not always so clear. Nor might it really matter. I have a lot of interest in how ideas happen, where they come from, how the evolve. I find that insanely interesting. But in ed-tech, or tech, or maybe other things, there can be a tendency to bleed from this curiosity over into “I did X first”… which is pointless. I do not see the latter happening. And boom! the next header I perk up at is “The Assignment Bank as a Loosely-Coupled Connection” — because he is talking not only about ds106 but the open assignment bank something I was present near its birth, had a hand in evolving, and have been working with as a concept as recently as two hours ago. Mike has modified it slightly, but he described how it came about how I remembered, out of the first open ds106 work of Jim Groom and Martha Burtis at UMW and me. But he also wove the inspiration of the kitting community Ravelry with the creation of the assignment bank. This is such a minor point that hardly matters to Mike’s point, and I should have just let go. What Mike write was close enough to what I recall, but to me left off he contributions of Tom Woodward who was present with us on a December 2010 Skype brainstorming call about DS106. And I have heard Jim describe Ravelry as an inspiration for the community aspects of DS106, but my brain had no memory connection with the start of the Assignment Bank. but that’s likely because that is the story I told them! And I did not do much on the initial syndication build of DS106; that was something Jim and Martha had been working on for years at UMW. But this is the web, we have a lot of shreds to work with. Because we blog. This will be case number 4667 that I make for narrating our work, because our human memory is quite malleable/faulty (especially mine). So on Dec 12, Jim blogged on this brainstorming skype call — there are even notes in of all places a wiki from that call. 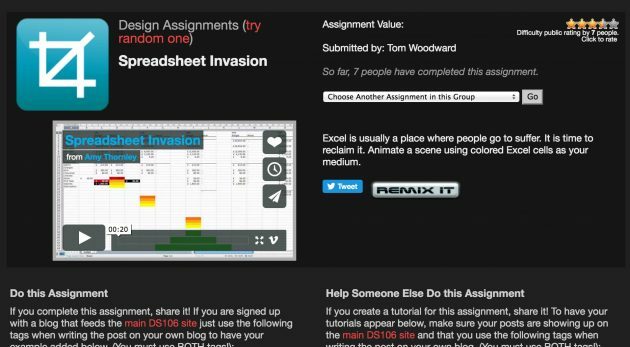 Tom had talked in that call of some game mechanics — in fact it was his idea of Assignment Wild Cards that inspired me to build the Assignment Remix site in 2012. We had dissed the idea of running synchronous webinar style things, and talked about how we use twitter as a place to create the live, real time action of DS106 (and it still does that). Twitter was still fresh and new and mostly free of bots and scumbags in 2010. I had my own post about the call (mixed in with some GIFs, the early DS106 was fueled by an excitement over artistic GIFs. The one I made of Frankenstein may be the first one I did by hand. At that time we were excited, and used for another year in DS106, an important site called The Daily Shoot, which provided each day a small challenge for people to do to practice their photo skills. People responded by tweeting an image to @Dailyshoot with a specific tag. My own idea, also influenced my dailyshoot (which you know I love) is that there could be small daily creative assignments available each day. One does not need to do them all, maybe for a class, it would be 2 or three per week. But they would all be small things one could do each do to create something new, maybe a graphic, a fake movie poster, a story played out in Amazon reviews. The thing about Dailyshoot is that it drives you to try new, and challenging, things. And we used the photography Daily shoot for the first year of Open DS106 in 2011; the site stopped running in October 2011, leading us to build the first DS106 Daily Create, pulled together by Tim Owens in January 2012, and later I modified to the current form of the Daily Create. But what about the assignment bank? I always had this story in mind that during that December 2010 Skype brainstorming call that Tom went on a rant about Jim’s 10 holy assignments, that he speculated the idea of a bank of assignments people could choose from and contribute to. Also, Martha’s submit your assignment via Google Spreadsheets, which republishes as a post with a unique category through FeedWordpress is awesome—as is her “repository” of digital storytelling examples gathered by the class over time (repository probably not the best word—we are working on alternatives). I had in my mind that Martha built the assignment bank after the call, but she had already been doing it before. 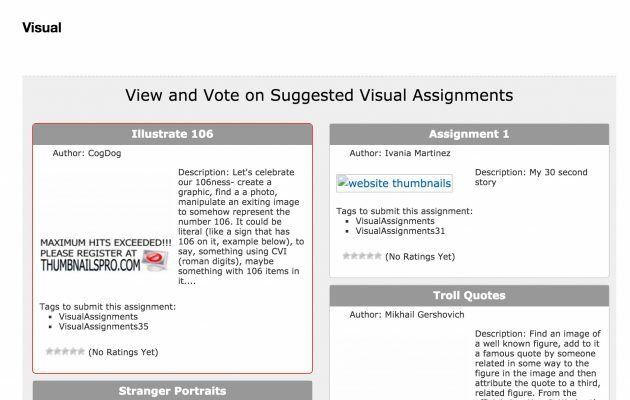 And all the basics of the Assignment Bank are here- not only the submission form, but the grouping by media type, the star ratings, the tags someone had to use to get their response attached. The site was using some kind of third party service that generated thumbnail images of outside web sites (which eventually broke more often than not). This was not yet a separate subdomain- for 2011, it was within the main DS106 site. 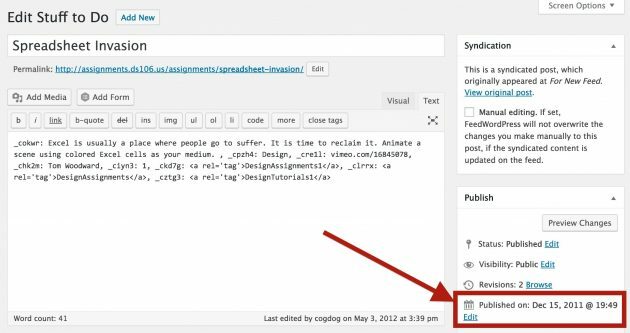 I can see by peaking at the source code that Martha had created a custom post type for assignments, and was likely using the Views plugin to display. I have to say that I am most confident that the Assignment bank is totally the idea and prowess of Martha Burtis, all hail Martha, as she is awesome. There is a pretty big gap in the Internet Archive for the ds106 site from late 2011 til almost mid 2013. Nothing for 2012 — which is too bad because that was when Tim Owens came on board and totally revamped the main site into its current design as well as rolling out the Daily Create. This too was Martha’s work. She figured out a way to extract the data from that Google form and convert it to the custom post types in the new Assignment bank as its own site. I actually cannot figure out how this works, it’s some kind of field markings in the post. It Still Works. I did not get my hands on the insides of the site until I was working at UMW in Spring 2012. The heart of the site has not changed, and still what almost no one will ever see as the brilliance of what Martha did in setting up the assignment bank as using Feed WordPress to resyndicate from the main ds106 Feed WordPress site- Syndication of Syndication. My additions were some optimizing of the single assignment displays, generalizing some code as function, changing the front to use the WordPress assignment taxonomy to produce the menu instead of fixed images. Starting in August 2012, I began work on what has evolved into a number of projects- I took the system that was built specifically done for the DS106 Assignment bank to a more generalized theme that could be used for other kinds of collections, the DS106 Assignment Bank theme and later doing a version of the Daily Create as a replicable theme, the Daily Blank. I’ve put these into use in many projects since then… the UDG Agora Challenge Bank is the ds106 Assignment Bank (with better features added for writing responses on site) and I am doing more modifications to put it to use for a project with creative commons. 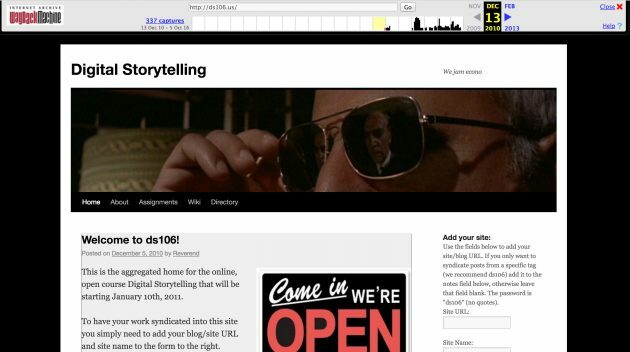 The ds106 Daily Create now uses my newer version, but has also been used in other sites (not all mine). So, to cut a long post long, credit for the DS106 Assignment Bank is truly on Martha Burtis, I have just been running with it since then. It remains to me a powerful concept, of not just the part of users creating assignments, but of thinking less of teaching as a fixed path, as mix described in his post of “loosely-coupled”. Does all this digging for when things happened matter? You have to say– in comparison to what? Even with a fair bit of written “evidence” I still had to dig to find missing parts (which is more fun that I can describe). There is a lot to be said for being able to find old blog posts. And truth? Well, it hinges on who is talking and who is listening. It is so relative. But this Bank thing has been a great ride that keeps on going. 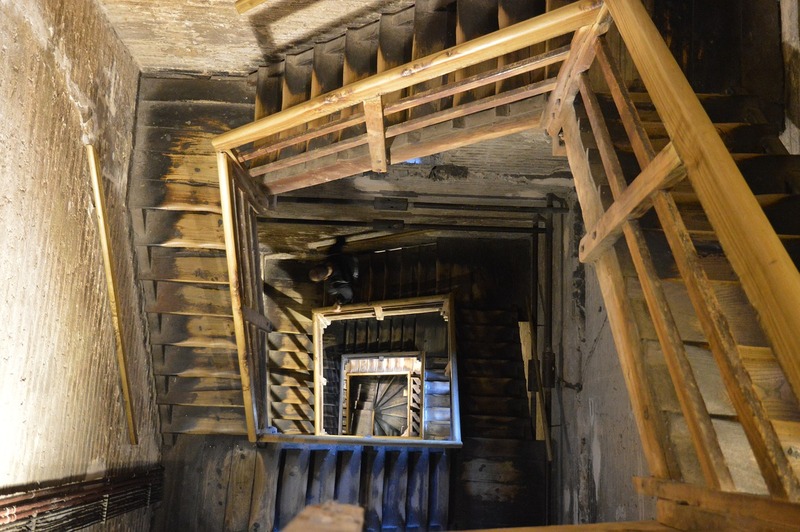 Top / Featured Image Details: I started looking Google Images (filtered for licensed to reuse) on “Historian”, scrolling and scrolling past images of books, and men with books, and statues, and almost gave up until I see this Escher-like image looking down a stairwell. It just felt right. What you fail to acknowledge here is that Dr. Oblivion is > the Assignment Bank. Why do you reify assignments over the disembodied critique of virtualized contingent labor that is Oblivion? You are privileging particular elements of ds106 over others and I find that an affront to the broader history of the class. Ideas and people over tools and assignment banks. You are re-writing the narrative of this class to suit your own “historical” ends and this aggression will not stand. You have not heard the last of this, and that is far more certain than any imagined history of ds106.